So, the US laws are flawless, its allies are not viewed as equal partners because they must follow America’s lead, or, in other words, do what they are told, and it’s up to Washington, not the national governments and parliaments, to decide what investments they need and where that money should come from. The leaders of the Central and Eastern European states should find it awkward, being rebuked for having overlooked “the foundational importance of the nation-state and national sovereignty,” while allowing unfriendly China and Russia to move in. “Our allies in Central Europe must not be under any illusions that these powers are their friends,” Mr. Mitchell explained. Obviously, he is quite sure that the governments of these nations are unable to grasp who is their friend and who is not. They are as naïve as small children. It’s good that the US is right here ready to enlighten them. Unlike its rivals, America does not seek dependencies, but rather independent states that should be “willing and able to share the burden of Western defense.” So, here is what independence à l’américaine is like, with its friends and allies absolutely free to comply with their protector’s instructions offering specific guidance about exactly how much they have to pay for defense, what investments to bring in, who to be friendly with, and how they should properly view the situation in their own region. Whatever happens in Central and Eastern Europe, everything has to revolve around the US. “The United States has long had a tradition of not interfering in the details of European integration,” Mr. Mitchell assured us. Of course, telling the UK PM to sue the EU and thus expedite Brexit can certainly not be seen as interfering in European integration. Suggesting to French President Macron that he take France out of the EU is another example of noninterference. 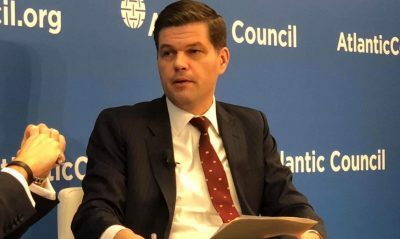 The Assistant Secretary expressed confidence that the allies could “beat back its competitors in Europe” with a little help from their American friends. Also addressing the Atlantic Council’s October 18 conference, US Special Representative for Ukraine, Kurt Volker, revealed that Washington plans to stiffen the sanctions regime against Moscow “every month or two” to make it more amenable over Ukraine. The new policy suggests increasing the sanctions periodically, over time. Those remarks came after Russian President Vladimir Putin told the Valdai Club in Sochi that he hoped that a government more friendly toward Russia emerges from the Ukrainian presidential election that will be held on March 31. What a bizarre way to convince his listeners! “This is a shockingly big and important humanitarian catastrophe that no one talks about. We have over 10,000 people killed,” exclaimed this official who represents a nation that has just sent Ukraine, a country notorious for the corruption in its military ranks, a shipment of lethal arms so that it can kill more of its own citizens or let the weapons systems fall into the wrong hands and be used to kill other people outside of Ukraine. The “wrong hands” could use those weapons against US military. With this kind of people you never know. There is no penetrating insight, no reading between the lines, no wasting time on anything like analysis, and no attempts to find the logic in anything that’s said — nothing like that is required. It’s easy to understand highly-placed US State Department officials. You guys do what you are told, or else. And, just in case, don’t forget that your best friend and closest ally overseas carries a big stick to force you to march in step. These speeches are delivered from time to time to ensure that their “dear allies” remember that. The Atlantic Council’s podium fits the bill. Featured image is from @chastime.